A lot of collecting is done through the mail now. With the Internet, collectors are able to connect with each other like never before. That's a good thing. It also means that good mail etiquette is extremely important. Whether you're selling or trading, it's important that you send things safely. And while there's no exact science to shipping cards, some methods are better than others. You've likely experienced some highs and lows when you've opened your mail. 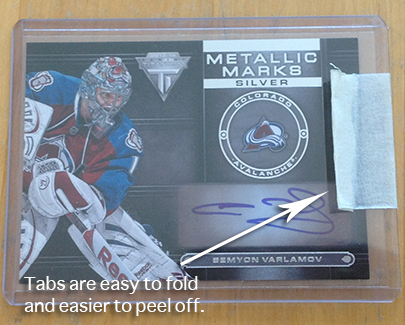 Here are some things to consider and mistakes to avoid when shipping cards in the mail. Practice safe shipping. Use some protection. You would think that it'd be obvious that even the newest collector shipping cards for the first time would think to use some sort of protection on their cards. Yet, there have been a few times where I've received cards that are simply tossed in an envelope and left to the graces of the postal gods. And while these cards have made it to me, they often show signs of a long, tough journey. Without something as basic as a penny sleeve and a top loader, you're leaving yourself open to easy damage and unhappy buyers and trading partners. No siree to the PWE! Plain white envelope is often a dirty word when it comes to sending cards through the mail. They may cheap and easy to find around the house, but they also offer very little protection. Bent, crumpled, ripped open -- these are just some of the horror stories collectors have dealing with the dreaded PWE. These envelopes are intended for pieces of paper like bills and letters from Aunt Petunia. Even a top loader can be enough weight to cause havoc in a busy postal system. If you're mailing a friend the last couple of commons they need to finish a set, a PWE is probably okay. A small bubble mailer is a much smarter option, though. Even the finest Scotch is bad when shipping cards. One of the most common practices when it comes to shipping cards is placing a piece of tape across the top of a top loader. This is meant to stop the card from slipping out. In theory, this is smart, but there are a couple of things to consider. Scotch tape is what I see the most. It's what I used to use. However, it's wasteful. When I receive a card for my personal collection, I don't want to have it stored with a big piece of tape on the top loader. When I go to peel the tape off, there's usually some goop left behind. Not only does it look bad, but it can lead to top loaders sticking together. Worse still is when I'm able to get some of the tape off easily, but not all of it. Now there's a mix of goop, tape and stickiness. I also get a lot of cards that have stronger packing tape across the top loader. This has the same issues as Scotch tape and more. Scotch taped top loaders is pretty easy to get into. Most of the time you just have to tear into it and it opens right up. Packing tape is different. I need a knife or scissors to open it. There's a little added risk that the knife can slip and end up leaving a nasty nick in the top of the card. Rather than using Scotch tape or packing tape, consider masking tape. It's plenty strong but when it's peeled off, it doesn't leave a sticky residue. It's also easier to peel off. If you want to win bonus points with the collector you sold to or traded with, fold a small tab at one end of the tape. This makes it even easier to peel off. My preferred way to send cards in top loaders isn't to use tape at all. I use team bags. They do a great job of keeping the cards from slipping. They're also very affordable and available in bulk. Leave the door open a crack. Protecting cards against the monsters of the postal system is a good thing. But don't be like the overprotective parent that makes their kids where knee pads on the jungle gym. Taping everything can actually be dangerous. If there's no way to get into a parcel, the receiver risks cutting into the cards. Boxes are generally okay. The cardboard might be a casualty, but they're easily replaced. What's worse is the card that's completely entombed in plastic wrap. Doubly dangerous is a card that's been entombed with strong packaging tape. When you're getting things ready to mail, leave an obvious road into the package. Be safe, but be reasonable as well. Who knows, you might even save a buck or two on supplies every year. Beware the corners with cardboard boxes. 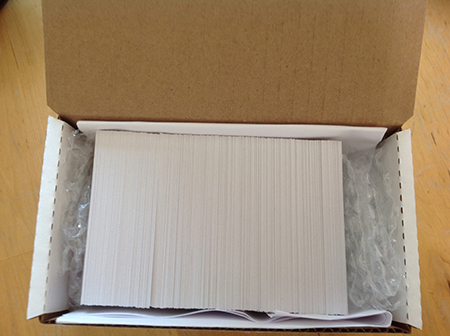 When it comes to shipping cards in bulk, like sets and team lots, there's little choice but to use card boxes. It's a common practice that's fine, but you need to take a couple of simple steps to make sure a bunch of the cards don't end up with damaged corners. While in process, parcels get tossed around as they go from one place to another. While the postal system does their best to take care of things, there is some basic wear and tear. That means that it's up to us to take some small precautions. The main goal of packing a box of cards is to make sure there's no room for them to move. Most people I've dealt with over the years have done a great job of making sure there's no back and forth shifting, usually with bubble wrap or packing peanuts. However, there's still a small part of the box that needs protecting, the edges along the top and bottom. Even though this space is small, it's easy for the cards to shift back and forth. A tumble off a shelf or a hard toss into a mail box and a good chunk of cards will have a mashed corner. When I ship in card boxes, I fold up a couple pieces of paper to give some added protection along the edges. Normally, it doesn't take more than a couple pieces along each edge to do the job. If you want to be even safer, pack the box well and place it in a bigger box. This will give plenty of protection. That said, the added size could make shipping fees higher. Here's a list of some of the common things you should have on hand when shipping cards (click on the links to shop for what you need on Amazon). - ideal when sending only a couple of cards. - good for sending about 100 cards or less. - For bulk lots and sets. The biggest thing to consider about shipping cards through the mail is that you're doing your best to keep them safe. At the end of the day, it's your responsibility to ensure they get there in the expected condition. If you cut corners or are lazy, expect to have a harder time getting strong bids on eBay or finding trading partners online. No mention of the blue painters tape? I only use the blue painters tape when I ship cards and it doesn’t leVe any type of residue. I also told it over and tape the top loader to the inside of the bubble mailer so it won’t move. A+ on the part regarding the erroneous use of scotch tape! It irks me every time I get cards from eBay and see pieces of scotch tape and/or packing tape on toploaders. There is no need for any type of tape period, if you use Team Bags that is!! Maybe you could send the card companies this draft. I had a redemption card mailed to me from Panini (An autograph card) and guess what was over the opening? Yep scotch tape! I’m very please to see the Scotch Tape mentioned here. I hated it from day 1. It’s only easy and convenient for the shipper. The Shippee is stuck with a new Top-loader that is almost always ruined. Also the Breaker that uses 2 Top-loaders on top and bottom of team set using tape on 4 sides needs to be set straight. This is my new crusade. Please join me. I use a removable clear 8-tab label from Avery. I print a thank you on it and fold it over the top. It never leaves any residue and peels right off. Had many a buyer comment on the ease of removal. Hey Jon, what’s the item # on those Avery labels? Just curious, as I’m considering using little Avery “pricing” stickers for mine. BTW I’ve had more fun with these than imagined, hope you can also. Whoa, those are WAY out of my price range! I was considering using 6741 colored tabs, but if you’re offering, I’ll take what I can get, lol. When sending just a few cards, a small bubble mailer, whilst good, is not infallible. If it was to be bent in half, the card(s) inside would most likely suffer the same fate. The other disadvantage of it is it increases the cost of postage as it has to be purchased, when there is a sturdier and free alternative. I will place the card(s) between two pieces of cardboard that are just marginally bigger than the card(s). I then wrap in just a thin sheet of paper to which I apply sticky tape and seal it. This way there is no chance of sticky tape touching any of the card – and also means the recipient can just tear the paper off rather than delicately trying to cut sticky tape from cardboard wondering exactly where the card(s) are located underneath if the two bits of cardboard were what was taped. depending on the exact thickness of the cardboard used, you can generally get 8-10 cards packed without going over 5mm width, which keeps it as a ‘small letter’. This makes it the cheapest it can possibly be and the cardboard makes it very sturdy. Wrapping in paper and then using your Scotch tape or other sticky means a secure card and one without anything stuck to it. Just got the old card flew out of the holder trick when opening a package. Well, now there are only 34 Alexander Barkov Black Memorabilia UD Masterpieces cards in NM/MT condition. In this case, I would have been happy to throw away and replace the sticky scotch taped case. Poor me! Can this url be sent to all EBay sellers ??? Please. Thanks for your useful tips. We should always be careful while going to parcels cards. The type of mailers we select depends upon the size of the cards and mostly the quality of mailers should be perfect to make it safe from any damage. I actually just stumbled on this and have to, once again, dispute that this is still WRONG. Anytime you use tape over the top of a top loader without anything else, you run a serious risk of destroying the card within when it gets bumped and tries to slide out of the top loader. Now, it’s not falling out of the top loader, but is now covered in tape residue because you will have to remove it from the tape it just got stuck to. Here’s the proper way to ship a card or cards. Penny sleeve the card. Place it into the PROPER size top loader. Take another penny sleeve and fold it over the top of the top loader so half is on the front and the other half is on the back of the top loader. Now, you use a small piece of tape with a folded tab to attach it to the front and the back of the top loader. Then you sandwich the top loader between two pieces of cardboard or two decoy cards and tape them together. You now should have a super protected brick. Ship this in a bubble mailer and you’re golden. Over 1100 feedback on eBay and 0 negs. This is key to that. You shouldn’t put tape over the end of a top-loader. The card can slide down and get stuck to the tape. You should put a piece of paper over the end, then tape the piece of paper in place. This way, if the cards get to the top of the top-loader, it won’t get stuck to anything and become damaged. Any recommendations for packing and shipping a full 3200 count box of football cards. You are not purchasing a toploader, so there should be no expectation that you will get one in pristine condition. That’s like asking that they somehow get the envelope to you without sticking the flap down so you can reuse it. The top loader is part of the packaging that the item you bought is being shipped in;its not part or what you purchased. Penny sleeve loaded from the top, TCG sleeve loaded from the bottom, Toploader loaded from the top tape. The card can NOT stick to the tape. No paper needed and the card can be photoed every step of the way with minimal obscuring.